As some may know, I enjoy tinkering around with different stove and cook pot combinations. In the past I have posted about a few different set-ups, and yet again, today I am posting about another one. This one is not necessarily “SUL,” or maybe not even “UL,” but that doesn’t really matter. What does matter, is that this is a kit that I have found works well together, suits my needs while on the trail, is durable, efficient, and ok, in my opinion, lightweight! My drinking cup is the MLD 475 ml titanium mug, and has a cut down can cozy around it to keep the titanium cup from burning my hands when it is filled with a hot beverage. There is also a silicone Hot Lips on the lip of the mug to keep the hot mug from burning my lips when drinking from. The mug with the cozy and the Hot Lips weigh in at 1.7 oz, and being that it is made of titanium, it can also be used to actually boil/heat my water in. This is nice since I don’t have to use my cook pot to boil water for both my food and drink, and actually allows me to get by with a smaller cook pot. 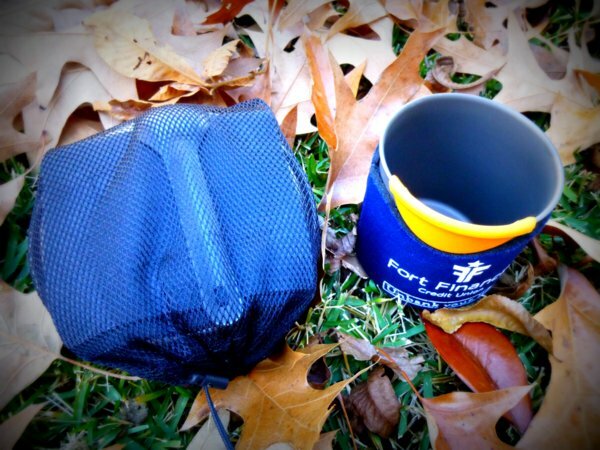 The total combined weight of both my cook kit and the MLD mug is 7.9 oz. I actually picked up the last 0.6L Evernew “UL” titanium cook pot that LawsonEquipment.com had in stock earlier this year. After using both my 1.3L and my 0.9L Evernew cook pots, I really wanted to get the smaller 0.6L version to try out. I like the fact that these are short, squat pots, which do really well with most alcohol stoves. And despite the small size/volume, I have found that it is in fact the perfect size for me to either boil 2 cups of water to rehydrate my meals, or, even better, I can fit my “Pad Thai” meal that I like so much inside the cook pot and cook it right in the pot! Uh-oh! Cook in the pot!? Wha…. I also like the fact that the shorter pot will allow me to use a shorter (lighter) spoon. Every since John Abela introduced me to the Sea 2 Summit Alpha Light Short spoon, I have been looking for a way to fit it into my cook kit. At 0.2 oz, it is lighter than most other spoons, and being that it is made from a “durable, hard-anodized aircraft grade aluminum,” it is stronger than plastic spoons. So, as I just mentioned, I can actually cook meals inside this short pot, which provided a great opportunity for me to pick up this spoon! Of course, as we all know, these precious alcohol stoves need some protection from the wind when using them in order for them to be efficient. So, I have made a windscreen from some aluminum tooling foil which fits around the 0.6L Evernew cook pot and is held together with 2 small paperclips. 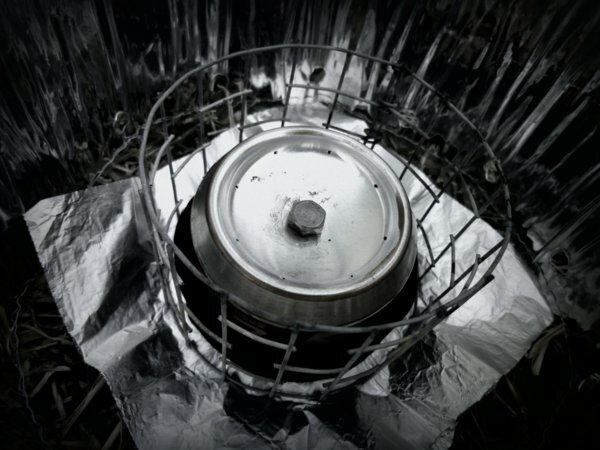 (I choose to go with the aluminum tooling foil because I can fold it flat and it will pack inside the cook pot.) The windscreen is sized to allow up to a 1/2″ gap between the side of the cook pot and the wall of the windscreen. However, due to the slower, smaller burn that this stove creates, I have been using it with only about a 1/4″ gap all the way around. To finish up the system, I am using a simple piece of aluminum foil folded over in half as my ground sheet/heat reflector. Of course, this is also able to fold up small and flat, and fit inside the cook pot (not to mention it is inexpensive to replace). The pot stand is made from hardware cloth and is 4 squares tall by 18 squares long. 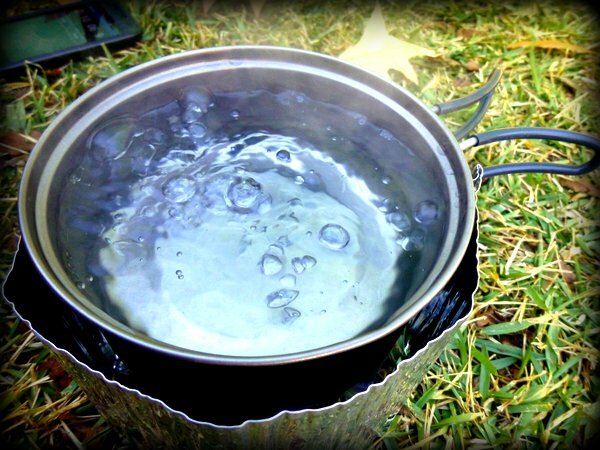 As I mentioned in the video below, I found that the JC250 stove does get faster boil times with a pot stand that is 5 squares tall, however, to make sure that the pot stand fits inside the 0.6L Evernew cook pot I had to make this pot stand 4 squares tall. But, I can still achieve a full rolling boil when using this pot stand and stove combo, it just takes a minute or so longer. In the video below, I used 20 ml of S-L-X Denatured Alcohol inside the stove and put probably another 3 ml of fuel around the primer ring. This amount of fuel brought 2 cups of cold (out-of-the-tap) water to a boil in about 8 minutes and 30 seconds, and was a full on, hard rolling boil a little after 9 minutes. The stove managed a boil until around 13 minutes and then finally completely flickered out at 16 minutes and 44 seconds! So, I know that there are things I can do to lighten this up a bit (such as switching out the mesh stuff sack for a cuben fiber stuff sack), and knowing me, I will probably get around to doing so. And I also know that some would suggest leaving behind the mug, or just going with a slightly larger cook pot…or something. But, that is not the point of this. I am pretty happy with this set-up as it is and I thought it was interesting enough to write about and share it with everyone else. As many probably know, this is not my only set-up, and it definitely won’t be my last! Heck, I have a couple of other cook kits in mind (and on my Christmas List) and am even expecting a Rollover stove from Smokeeater908 in the mail tomorrow to tinker around with! So, this kit is not permanent, but it is one that I thought worked good together! Disclaimer: Both, the JC250 stove and the EvaRest pad was sent to me for personal review earlier this year (from their respective makers). The rest of the items were either made by me or I paid for with my own money. I am under no obligation to write about any of the above items. 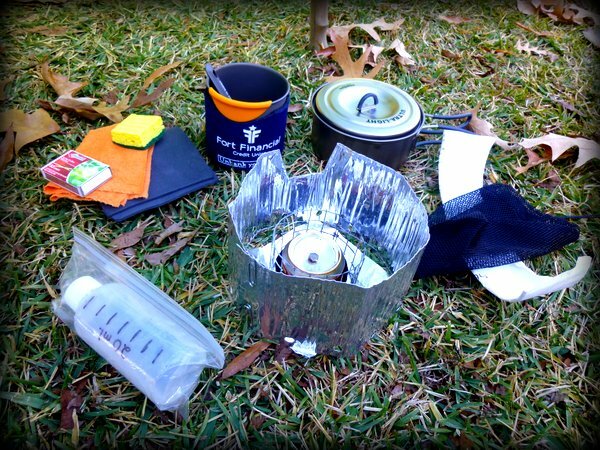 This entry was posted in Cook Kits, Cups/Mugs, Spoons and tagged 0.6L Evernew "UL" Titanium Cook Pot, 1/8" EvaRest CCF Pad, Alcohol Cook Kit, Backpacking, Backpacking Cook Kit, Carbon Felt Primer Ring, Cook Kit, DIY Aluminum Windscreen, Foil Ground Sheet, Hiking, Hot Lips, JC250 Stove, Lightload Towel, Lightweight Backpacking, Mesh Stuff Sack, MLD 475 ml Titanium Mug, Picharpak Workshop, Sea 2 Summit Alpha Light Short Spoon, UltraLight Backpacking. Bookmark the permalink. The pot scrubber is a great idea for short trips, however it harbors bacteria which can affect longer ones. They are designed to be sanitized in a dish washer which makes them easy to use at home and on those shorter trips (just throw it in the dish water when you get home). On the longer ones I just make do with the LightLoad towel, soaking, the bottom of my AlphaLight Spoon (occasionally a little sand), and good old fashioned elbow grease. I even stay away from the Dr. Bronners soap because for me at least I find it hard to rinse the pot thoroughly enough and soap in itself can cause mild diarrhea. Just my 2 cents. Awesome gear review! I am looking at buying some of the aluminum tooling foil to try it out! That is a great point about the scrubbie pad. I wouldn’t mind changing them out after each trip just because they are so inexpensive for a pack of 3, and then I can cut each one down and get about 8 of them the size that I have. Unfortunately though, the longest trips I will be on for a while will be around 5 days, and most of them only being 3. But hey, I will take what I can get! I do not plan to cook anything that will be too hard to clean off though in the pans. I think that the muffins I have been practicing with will be the most difficult. The cozy is just a cheap cozy that can be found at any gas station, or grocery store and fits on ordinary coke/beer cans. I just cut the bottom out of it so that it would be a tube shape. This cut down on weight, and IMO allows just a bit more stretch to it so that it fits better. When using the mug on a stove, no, I do not leave the cozy on. I have not tried it, but being that the mug is so small in diameter, flames will more than likely lick up the sides and I am not sure how these would do in the direct line of fire… If I use the mug on a stove, I will simply wait about 20 – 30 seconds after taking it off the stove and the top rim is cool enough to handle (with ti, the only area that stays hot is where there is water on the other side, so past the fill line cools). Then I just grab it by the rim and slide it in the cozy. I would imagine that the hot lips would be ok to leave on while on the stove since it would not get hit so much with flames, but I decide to take it off. It is very simple to add/remove, so I don’t take the chance. And in case your wondering… as I mentioned, the lip of the mug cools quickly, so why use hot lips if it is cool? Well, as soon as you tip it back the hot water moves up to the rim and will heat it up again (since it is so thin, it happens quick enough). This can result in at least an uncomfy sip, or even a burnt lip… so hot lips it is! I’m w/ ya Stick! I’m getting ready to reorganize / experiment w/ some stoves & cook pots. I’m been eyeing the stuff at lite trail too. Especially the esbit wing stove. Enjoy the little rollover stove. I’ve been enjoying the F&M stove. Do you ever burn yellow heet? I have a few bottle here I’m thinking about using just for testing at home.